Ely, United Kingdom –SAMSON Materials Handling Ltd. has introduced a new generation of its mobile STORMAJOR Boom Feeder. The new, updated design promises to improve handling and stability in the loading and reception of all kinds of bulk materials and is available in three models for different ranges of bulk material density. The new generation design is the result of decades of experience with the previous generations of these machines from SAMSON. It combines a mobile truck unloader with a moveable boom. 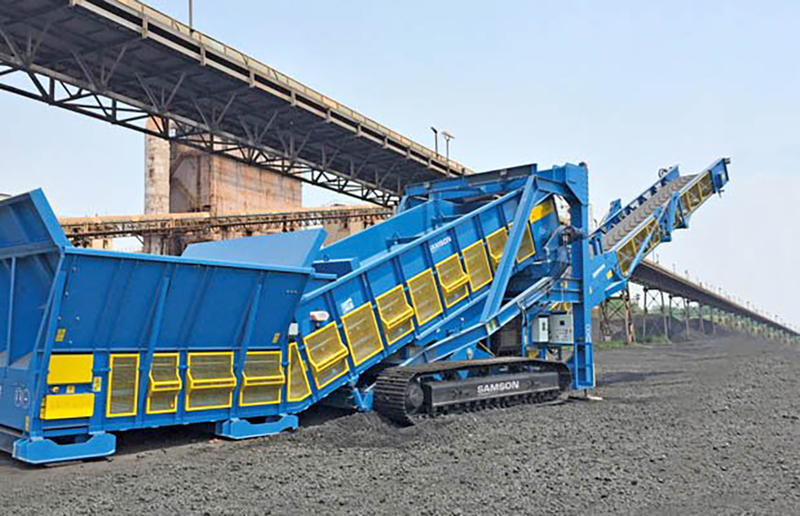 This versatile unit allows the operators of ports, goods depots and stockpiles to receive bulk materials directly from trucks, front-end loaders or other loading equipment and to load them into vessels or railway wagons. As the new STORMAJOR® is fully mobile, it is also ideal for the efficient stockpiling of bulk materials. Each version of the STORMAJOR® has two travel and power options. A wheel-mounted STORMAJOR® will be towed, or a tracked machine will have its own drive. When moving the machine fully loaded, it can be equipped with additional outrigger support. The new generation STORMAJOR® is offered with a choice of engine and drives. For example, the conveying sections can be either electrically or hydraulically driven. The self-driven versions can be equipped with diesel generator sets with various emissions standards, up to TIR5. The main drive concept depends on off-site power supply or pumps and generators driven by the diesel generator sets. The “Power twin” sets new standards here with an additional distribution gear directly flanged on to the diesel generator set. Thanks to a large range of extras, each STORMAJOR® can be further tailored to the specific requirements of the application. Examples of these enhancing features are additional transfer chute systems, various lining options for chutes and conveyor, dedusting solutions, additional enclosures for the conveying sections, operation and maintenance platforms, operator cabins and lighting packages.